You already very familiar with James Bond, a fictional character of the British secret agent codenamed '007', which created by the British writer Ian Fleming in 1953 and has became one of the most successful figures in the world of entertainment. No less than twelve novels and dozens of movies have been made about it. From many of the film, Bond is always uses some high class or luxury cars for fighting his enemies. Of course the most famous is the Aston Martin DB-series that are still mass produced until today. In addition to the car, turns Bond also been using motorcycles. And one of the motorcycles used by him relatively unique, a three-wheeler with large tires called Honda ATC 90, which stands for All Terrain Cycle. 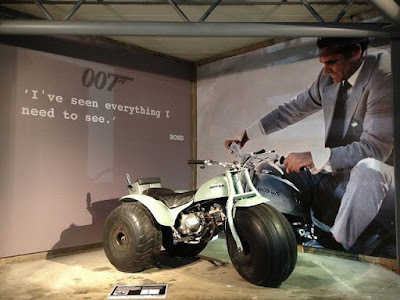 This motorcycle used by Bond in the Diamonds Are Forever (1971) movie. At that time, James Bond, played by Sean Connery, the actor who is active until 2006. 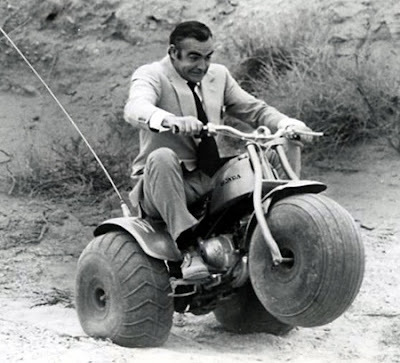 In this film, James Bond riding a Honda ATC 90 while fleeing from Whyte Space in Moonboggy. This bike is the first all terrain vehicle (ATV) in the world, which is in the process of development started in 1967 and led by Osamu Takeuchi. In the end, this vehicle is also known as the farmer's vehicles. ATV eventually no longer be used because it has a tendency to be easily rolled. From the technical side, Honda ATC 90 carrying an engine capacity of 89 cc, and been equipped with water-cooled technology. And from the engine weighs 90 kilograms can give the power up to 8 hp. Produced just over three years, Honda ATC 90 has now become a rare motorcycle. One of them was sat in the David Silver Museum, Suffolk, England. And today, as reported by the Motorcyclenews, the bike's price is estimated at between £2,500 to £5,000.